The Royal Swedish Academy of Sciences or Kungliga Vetenskapsakademien is one of the royal academies of Sweden. It is an independent, non-governmental scientific organisation which takes special responsibility for the natural sciences and mathematics, but endeavours to promote the exchange of ideas between various disciplines. Tore Ellingsen is a Norwegian economist active in Sweden. Björn Peter Gärdenfors is professor of cognitive science at the University of Lund, Sweden. He is member of the Royal Swedish Academy of Letters, History and Antiquities and recipient of the Gad Rausing Prize. He received his doctorate from Lund University in 1974. Internationally, he is one of Sweden's most notable philosophers. In 2009, he was elected member of the Royal Swedish Academy of Sciences. and the Royal Swedish Academy of Engineering Sciences. He is member of Deutsche Akademie für Naturforscher and of Academia Europaea. In 2014 Björn Peter Gärdenfors was awarded a Senior Fellowship of the Zukunftskolleg at the University of Konstanz. He was Member of the Prize Committee for the Prize in Economic Sciences in Memory of Alfred Nobel 2011-2017. Torsten Persson is a Swedish economist at the Institute for International Economic Studies, Stockholm University. He has also taught in England, the United States, and Israel. He has collaborated extensively with Guido Tabellini. The secretary takes part in the meeting, but can not cast a vote unless the secretary is also a member of the Committee. Lars Erik Oscar Svensson, is a Swedish economist. He was on the faculty of Princeton University 2001–2009. Since May 2013, he is Affiliated Professor at the Stockholm School of Economics. Since 2009 he is Affiliated Professor at Stockholm University. He has published significant research in macroeconomics, especially monetary economics, international trade and general equilibrium theory. He is among the most influential economists in the world according to IDEAS/RePEc. He is a well-known proponent of price path targeting, a topic on which he published significant research. Peter Englund, is a Swedish economist. He was professor at Uppsala University 1988-1998 and is professor at the Stockholm School of Economics since 1998. Karl Gustav Jöreskog is a Swedish statistician. Jöreskog is a Professor Emeritus at Uppsala University, and a co-author of the LISREL statistical program. He is also a member of the Royal Swedish Academy of Sciences. Jöreskog received his bachelor's, master's, and doctoral degrees in Uppsala University. He is also a former student of Herman Wold. He was a statistician at Educational Testing Service (ETS) and a visiting professor at Princeton University. Carl Assar Eugén Lindbeck is a Swedish professor of economics at Stockholm University and at the Research Institute of Industrial Economics (IFN). The Institute for International Economic Studies (IIES) is a Swedish research institute at Stockholm University, founded in the early 1960s. The main objective is to produce outstanding research for publication in leading international journals. Scholars from the IIES have received a number of international awards, such as one Bank of Sweden Prize in Economic Sciences in Memory of Alfred Nobel, one Yrjö Jahnsson Award, and five out of six Söderberg Prizes. 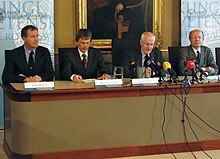 Among many other honors, two IIES scholars have been elected Presidents of the European Economic Association, one elected President of the Econometric Society, three elected Foreign Honorary Members of the American Academy of Arts and Sciences, and six elected members of the Royal Swedish Academy of Sciences. A number of IIES scholars hold positions on the Editorial boards of top international journals. Per Lennart Krusell, born 1959, is a Swedish macroeconomic theorist who currently holds the Savings Banks Foundations and Swedbank Chair in Macroeconomics at Stockholm University and is associated with the Institute for International Economic Studies in Stockholm. Until recently, he was a Professor of Economics at Princeton University and, before that, held positions at the University of Rochester, the University of Pennsylvania, and Northwestern University. He received numerous awards and grants, most recently the 2007 Söderberg Prize and a 2.1 Million Euro 2008 senior research grant from the European Research Council. Krusell's research has focused on macroeconomics, broadly defined, with particular contributions in the areas of technological change, inequality, political economy, macroeconomic policy, and labor economics. He is currently pursuing a long-term project on the interactions between global climate change and the economy. He is especially known for developing the most widely used computational algorithm for calculating macroeconomic equilibrium under rational expectations in economies with heterogeneous agents and aggregate uncertainty when financial markets are incomplete. His work with Jeremy Greenwood and Zvi Hercowitz on investment-specific technological progress has also been extremely influential. Erik Filip Lundberg was a Swedish economist, born in Stockholm. He was a professor of political economics at Stockholm University and a member of the Stockholm School of economic thought. He was president of the International Economic Association from 1968–1971. From 1969–1979, he was a member of the committee that selects the laureates for the Sveriges Riksbank Prize in Economic Sciences, the Economics Prize Committee, and served as the committee's chairman from 1975–1979. Sven Ingvar Svennilson was a Swedish economist that became known for his theories in planned economics. He was a member of the Stockholm school of economic thought. From 1969–1971, he was a member of the committee that selects the laureates for the Sveriges Riksbank Prize in Economic Sciences, the Economics Prize Committee. Sune Carlson was a Swedish economist. He was considered a pioneer in establishing international business as a research area. The probabilistic voting theory, also known as the probabilistic voting model, is a voting theory developed by professors Assar Lindbeck and Jörgen Weibull in the article "Balanced-budget redistribution as the outcome of political competition", published in 1987 in the journal Public Choice, which has gradually replaced the median voter theory, thanks to its ability to find equilibrium within multi-dimensional spaces. 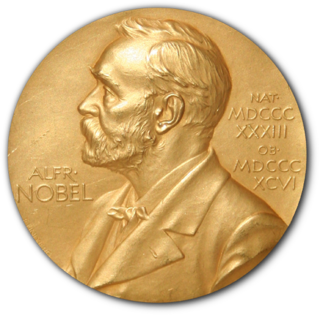 The Nobel Memorial Prize in Economic Sciences, commonly referred to as the Nobel Prize in Economics, is an award for outstanding contributions to the field of economic sciences, and generally regarded as the most prestigious award for that field. The award's official name is The Sveriges Riksbank Prize in Economic Sciences in Memory of Alfred Nobel. Lars Calmfors is a Swedish economist and professor of international economics at the Institute for International Economic Studies at Stockholm University. Ingemar Ståhl was a Swedish economist and an economics professor from Lund University. Gunnar Magnus Johannesson is a professor at the Stockholm School of Economics, as well as a member of the Committee for the Prize in Economic Sciences in Memory of Alfred Nobel. He is known for his research in the field of experimental economics. ↑ Lindbeck, Assar (March 1985). "The Prize in Economic Science in Memory of Alfred Nobel". Journal of Economic Literature. 23 (1): 37–56. JSTOR 2725543. ↑ "The Economics Prize Committee: The Economics Prize Committee 2006". Nobel Foundation. Archived from the original on 2006-12-23. Retrieved 2008-01-08. ↑ "The Economics Prize Committee: The Economics Prize Committee 2007". Nobel Foundation . Retrieved 2008-01-08. ↑ "Kommittén för priset i ekonomisk vetenskap till Alfred Nobels minne" (in Swedish). Royal Swedish Academy of Sciences. Archived from the original on 2008-05-04. Retrieved 2008-01-09. ↑ Jönsson, Peter (2007-12-17). "Jörgen Weibull: Har delat ut sitt sista pris" (in Swedish). Ekonominyheterna.se. Retrieved 2008-01-09. ↑ "Peter Englund: Curriculum Vitae" (PDF). Stockholm School of Economics. Archived from the original (PDF) on 2008-02-16. Retrieved 2008-01-09. ↑ "Lars Calmfors: Positions and exams". Stockholm University . Retrieved 2008-01-09. ↑ "The Beauty (Pageant?) of Economics". Federal Reserve Bank of Minneapolis . Retrieved 2008-01-16. ↑ "PER KRUSELL" (PDF). Princeton University. Archived from the original (PDF) on 2008-02-16. Retrieved 2008-01-09. ↑ "Timo Teräsvirta". School of Economics and Management, University of Aarhus. Archived from the original on 2007-11-16. Retrieved 2008-01-09. ↑ "Bertil Holmlund: Curriculum Vitae" (PDF). Department of Economics, Stockholm University . Retrieved 2008-01-09.